Volvo's small luxury SUV, the XC40, has been crowned Wheels magazine's Car of the Year for 2019. Competing against a strong field of contenders, the Volvo XC40 claimed the automotive excellence award at a gala dinner in Melbourne last night. It is a historical back-to-back performance by Volvo, as it is the first time a luxury car maker has achieved this feat. Volvo's luxury mid-sized SUV, the XC60, won the 2018 Wheels Car of the Year. 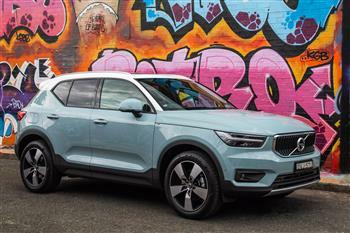 The Wheels magazine expert judges were impressed by the XC40's award-winning safety, connectivity and infotainment technologies, combined with its very distinctive, fun design, and radical new approach to interior storage. The XC40's well-deserved win demonstrates that revitalised Volvo's story arc still has some intriguing chapters to come. The Volvo XC40 forensically knocked over all comers when its scores were calculated against COTY's five criteria. Wheels magazine Editor, Alex Inwood summed up: "Has there ever been a more successful company turnaround than Volvo's recent form?" "We are absolutely thrilled to have won the Wheels Car of The Year two years in a row, firstly with the XC60 in 2018, and now in 2019 with the XC40. When we launched the XC40 we knew its styling, quality and performance was second to none." "To have it confirmed by Wheels' team of expert judges is a fantastic honour and one that we at Volvo Cars are extremely proud of." "2018 has been one of our most successful years in our long history as a brand in Australia. We have achieved double-digit sales growth led by the popularity of the XC40 and the XC60." "We have also bucked the trend in the overall car market, which was down 1.3%, and in the premium end of the market, we have increased our market share whereas most of our competitors have gone backwards." "Winning the 2019 Wheels Car of the Year is a fitting end to an incredible twelve months for Volvo and is testament to the evolution and growth of our brand in Australia, which is possibly the most competitive car market in the world." Mr Connor concluded. The Volvo XC40 is one of the best-equipped small premium SUVs on the market. Safety and driver assistance features on the City Safety, Run-off Road protection and mitigation, Cross Traffic alert with brake support. Additional items include Volvo Cars' Pilot Assist system and the 360° Camera that helps drivers manoeuvre their car into tight parking spaces. The XC40 is available in three variants equipped with a petrol four-cylinder Drive-E powertrain. Further powertrain options, including a hybridised as well as a pure electric version, will be added later. The XC40 will be the first Volvo model to be equipped with Volvo Cars' new 3-cylinder engine. 2018 Volvo XC40 T5 Momentum.